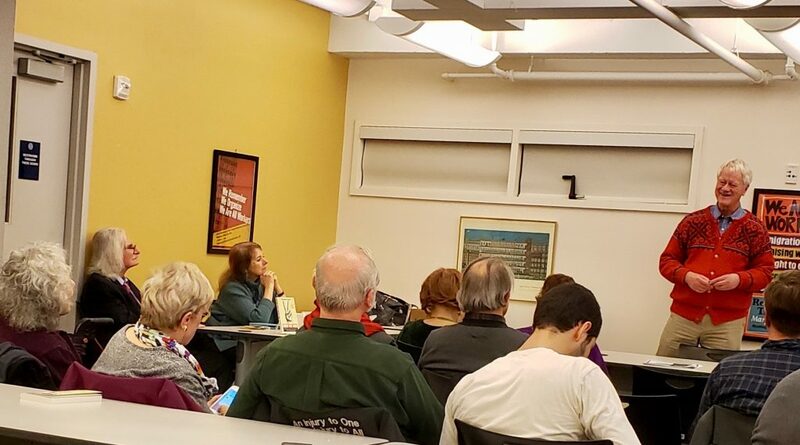 NWU member George Lakey spoke recently about how the Scandinavian countries went from a deeply polarized region in the 1920s and 30s, with Nazis and Bolsheviks fighting each other, to the most economically equal region with the highest productivity and most generous benefits in the world. Lakey, a recently retired professor at Swarthmore (PA) College, addressed an audience of about of nearly two dozen who gathered in the UAW conference room in midtown Manhattan to listen to his theory that a polarized society is akin to sculptor’s metal: When it’s cold, it cannot be worked. But when it is heated up, it can be molded into the most beautiful art. Social movements, he asserted, have likewise used times of deep polarization to bring in women’s right to vote, labor laws, and public health laws—all fueled by nonviolent, yet direct action. His talk led to a lively discussion about climate change and the spate of suicides among the school shooting victims and their families. Those present said there was a great need for citizens to rise up, but they also expressed worry that it was too difficult to gain ground during these chaotic times. Lakey, took an opposite tack, suggesting that we look back at history to gain strength from past victories, while summoning a belief that not only can we win, but that we must.